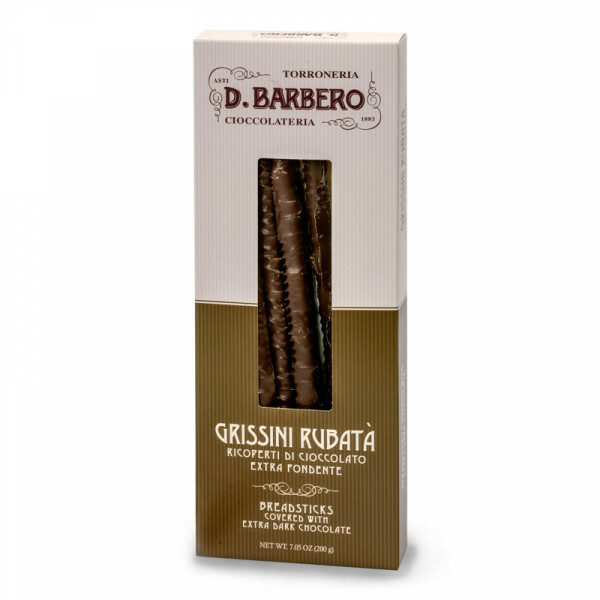 Typical from Piedemont, breadsticks coated in dark chocolate. A surprising match! Not only you will get two super typical products of Piedmont in one single bite, but you cannot beat the quality. The breadsticks are crunchy and lightly salted, whereas the coating chocolate is uncompromisingly bitter and lovely. Just be aware that you will never get enough of them. INGREDIENTS BREADSTICKS: type “0” wheat flour, lard 8%, salt, malted grain flour (wheat), yeast. INGREDIENTS EXTRA DARK CHOCOLATE (60%): cocoa mass, sugar, cocoa butter, anhydrous butter. Emulsifier: soja lecithin, natural vanilla flavouring. Min. cocoa content 50,2%. GLUTEN, SOY. IT MAY CONTAIN TRACES OF NUTS (ALMONDS, HAZELNUT, PISTACHIO), EGG.